Your go-to Camera catalog, jam-packed with the best camera brands in the industry and more state-of-the-art electronic essentials. Your Free Shipping offer will be applied automatically at checkout on the Adorama Camera website. 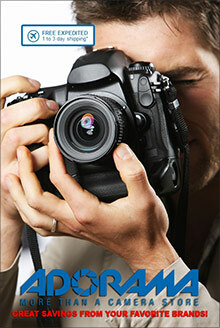 Best Cameras & more - Adorama is more than just a camera store. Besides featuring the best camera brands from Canon to Kodak, Sony to Samsung, the Adorama Camera catalog is also your go-to source for high quality electronics, offering computer and home theater systems, tablets, MP3 players and more. Focus on a sharp selection of digital cameras including point and shoot models, SLR cameras, instant, disposable and underwater cameras, panorama cameras, camcorders, HD video cams and more, only from the Adorama Camera store. TV & Home Entertainment - Pump up your home theater with a covetable collection of the best brand name electronic components, from Samsung to Toshiba. Browse flat panel and 3D enabled televisions, deluxe home theater systems, pro audio equipment, gaming hardware, film projectors and projection screens, MP3 players and more. Camera accessories - From filters and flashes to camera bags and cases to transport your cameras safely and efficiently, you'll find a wide assortment of photography accessories in stock in one consummate camera catalog. Update your gear with camera lenses and lens accessories, batteries and chargers, tripods, memory cards, film storage, dark room and film processing supplies, and even albums and frames to display your picture perfect shots for all to see. Computers - The best camera store online also brings you the best computer systems including desktops, notebooks and netbooks, iPads and other high-tech tablets. You'll also find a wide range of computer related peripherals and accessories, plus a bestselling selection of scanners and photo printers that will allow you to conveniently print your photos directly from any compatible digital camera, no computer required. Optics & Telescopes - For daytime or nighttime use, your online camera catalog is also your home for premium binoculars, optics and scopes. Choose from binoculars and monoculars, telescopes, microscopes, shooting optics, CCD cameras and the best camera brands in Astro photography, as well as adapters, reflectors, reducers, and an extensive selection of accessories that will satisfy all of your optic needs. For over 30 years, the Adorama Camera catalog has served as one of the nation's largest photo retail and mail order suppliers, serving professionals as well as amateurs in the photographic, video, digital imaging and telescope fields. Trust The Photography People at the best camera store online to set you up with the best digital cameras, camera accessories, supplies, and all things photographic.